Every Friday afternoon I will glance at the clock near me and do a quick calculation of the minutes remaining in my work day, and thus the countdown begins. Leaving work and heading home to the people I love, the television I watch and the Blu-ray collection I worship is always a terrific moment regardless of the day of the week, but man, nothing beats a Friday on the cusp of a lazy, relaxing weekend. This particular Friday, each passing minute felt like a tiny step towards something even more special and I could barely contain my excitement. Sunday is Easter and I get to experience the amazing moment when my daughter discovers what the bunny left her, a reminder that she is still young and innocent enough to believe in magic. One of a few days each year that my wife and I receive no credit for the money we spent or the effort put into organizing the perfect holiday, and we are thrilled to relinquish it to a fictional character because when she smiles, it's all worth it. The amount of time left in which she believes is nearing an end. What remains needs to be cherished. That isn't everything though. There is more. Once the events of Easter have concluded and my belly is sufficiently stuffed with ham, I will turn on the TV and prepare myself to watch something that I have spent my entire life madly in love with, a game that feels lyrical and beautiful, one that fills me with a nostalgic warmth that can hardly be described with words. As far back as I can remember, I have loved the game. When winter is at its worst and the cold feels relentless, I will randomly close my eyes and picture that moment when the first pitch is delivered on a beautiful, sunny day. I will practically smell the freshly cut grass as I look out at the majestic glory of Wrigley field. I will hear the crack of the bat as if it was right there in front of me. I have been thinking about these moments ever since last fall when the final out was recorded, and the magic of the game will return on Sunday night. I knew it was the right time to revisit a classic, a film that both invokes my passion for baseball and also triggers my memories of watching it repeatedly growing up. 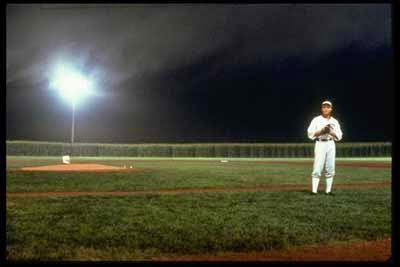 I knew it was time for Field of Dreams. It isn't a perfect movie. It is overly sentimental and undeniably manipulative, but I just don't care. What it strives for, it achieves as I connect on a pretty deep emotional level every single time I revisit that striking field in the middle of a farm in Iowa. 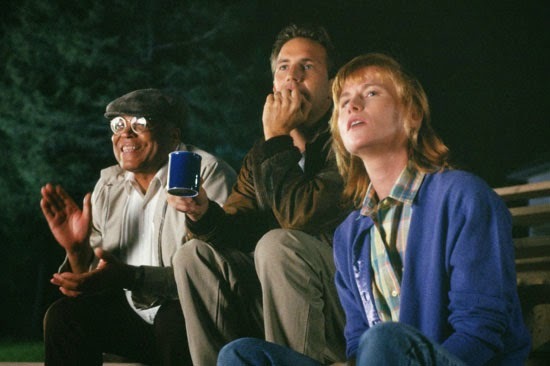 Field of Dreams is basically impossible for me to watch with an overly judgmental or unbiased, critical eye because sometimes a film transcends the way you would normally put every aspect of a work under a microscope. I choose not to inspect this one too closely. I choose to just sit back, relax and breathe it in. I will spend these days with my family. I will have fun and watch movies and witness the miracle of a child filled with wonder, and then I will embrace the return of my favorite sport. Sounds like a pretty great weekend to me.